For plein air painters who like to travel light, the portable, compact Guerrilla Painter ThumBox has it all. Reminiscent of the original "cigar box" pochade boxes used for quick outdoor painting by 19th and early 20th century painters, the original ThumBox included a special thumbhole in the bottom so it could be hand-held while painting — hence the name, "Thumbox." Now featuring a slimmer, lighter, simplified design, the ThumBox Version 2.0 is easier than ever to transport. Based on an ultra-light pochade box that Guerrilla Painter Carl Judson built to use while doing volunteer work in the back country of Bolivia in the 1990s, the ThumBox Version 2.0 still includes the high-quality features and accessories that made the original ThumBox so popular. The ThumBox Version 2.0 holds two wet 6" × 8" panels (1/8" or 1/4" thick) fully enclosed inside its lid. The raised front lip that offers this protection also serves as a built-in hand rest or "mahl stick." The lid bracket locks in any position within a full 180° range and is easily adjusted using only one knob. 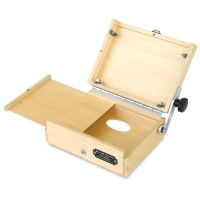 Other popular carryovers from the original ThumBox include a slide-out palette, a storage compartment, and panel and canvas adapter clips. The ThumBox Version 2.0 is pre-drilled to accommodate the Guerrilla Painter Universal Tripod. 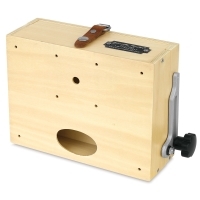 The ThumBox Version 2.0 measures 9"L × 7"W × 3"D and weighs 1.5 lb. Palette Extension Kit — Double your work space and increase the flexibility of your ThumBox with this hinged palette extension. Made of birch plywood and aluminum, it features holes to rest your brushes, and little metal feet that keep it elevated above your palette when closed. It easily attaches into the existing pilot holes on the ThumBox. It measures 6" × 8". Note: With the Palette Extension Kit installed, the ThumBox will only accommodate one wet panel. Slip-In Easel — The Slip-In Easel by Guerrilla Painter allows you to paint with more gestural brushstrokes because it holds your panel or canvas up and away from the lid of your ThumBox. It is crafted of lightweight yet sturdy corrugated enameled aluminum with adjustable metal fingers that accommodate panels up to 9" high by any width. ThumBox Version 2.0 Kit — This set includes a Guerrilla Painter ThumBox Version 2.0, ThumBox Tote, Large Mouth Single Palette Cup, Mighty Mite Jr. Brush Washer, Set of 4 Flat Pocket Bristle Brushes, 5" × 7" Plein Air Gessoed Panel, and Composition Finder, plus A Guerrilla Painter's Notebook volumes 1 and 2 (containing company founder Carl Judson's essays on his adventures in Guerrilla Painting). 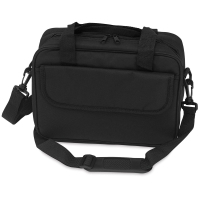 ThumBox Version 2.0 Tote — This zippered nylon tote includes a large exterior pocket with a Velcro closure for supplies, a small exterior pocket for an identification card or other small items, a mesh interior pocket for paints and brushes, and a nylon shoulder strap. It measures 9"L × 11"W × 4"D and weighs 0.5 lb. Note: This tote is not intended for use with the original ThumBox.